WASHINGTON — Global fleet operator Eutelsat, after months of protracted negotiations with partner Viasat, on April 5 said it would go it alone on a powerful new satellite instead of investing in Viasat’s second ViaSat-3 satellite. Thales Alenia Space is instead building a “VHTS” or Very High Throughput Satellite for Eutelsat called Konnect VHTS, bringing 500 Gigabits-per-second of Ka-band capacity to European markets. The European manufacturer is also building the accompanying ground segment. Eutelsat’s decision to forgo an investment in a 1 terabit-per-second ViaSat-3 satellite with coverage of Europe, the Middle East and Africa (EMEA), comes after months of back and forth discussions with Carlsbad, California-based Viasat meant to iron out the details of a broadband joint venture the two operators started last year. Rodolphe Belmer, Eutelsat’s CEO, said in October that arduous but good-spirited negotiations were continuing over the framework of the ViaSat-3 EMEA satellite. Those negotiations were expected to conclude last year, but dragged on into this year. Viasat CEO Mark Dankberg told SpaceNews in March that determining which operator would claim revenues from respective customers was at the crux of the debate. It is not immediately clear what the full impact Eutelsat’s Konnect VHTS purchase will have on the joint venture. Eutelsat was co-financing ViaSat-3 EMEA, having earmarked a 132.5 million euro ($162 million) investment Viasat made to obtain a 49 percent stake in Eutelsat’s seven-year-old KA-SAT broadband satellite. Eutelsat was going to reinvest that money back into ViaSat-3 EMEA, but that is no longer the case. “Eutelsat has a right to make the Konnect VHTS investment outside of the joint venture, so there is no direct impact on the Viasat joint venture,” she said. Eutelsat said Konnect VHTS will have “the most powerful on-board digital processor ever put in orbit, offering capacity allocation flexibility, optimal spectrum use, and progressive ground network deployment.” Though only half the capacity of a ViaSat-3 satellite, Konnect VHTS is more geographically concentrated, focusing only on Europe instead of a third of the planet. Konnect VHTS is still one of the highest capacity satellites ever announced, on par with Hughes’ 500-Gbps Jupiter-3 satellite Space Systems Loral is building for broadband in North America. The Konnect VHTS satellite has a mass of 6,300 kilograms, and is scheduled to enter service in 2021. Eutelsat has not yet announced a launch provider for the satellite. 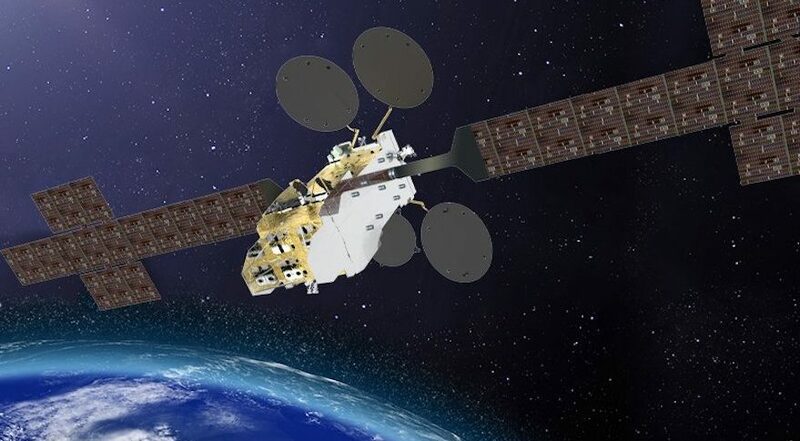 Eutelsat is adding substantial new capacity to the EMEA region through a lease on YahSat’s Al Yah 3 satellite, which is expected to reach its orbital slot in June. Another Eutelsat satellite under construction by Thales Alenia Space, the Africa Broadband Satellite (which Eutelsat is rebranding as “Konnect”), is scheduled to launch in 2019 with 75 Gbps of capacity distributed through 65 spot beams. “High-speed broadband will be a critical driver of Eutelsat’s growth from 2020 onwards. Over the next decade, VHTS satellites will bring enough capacity to serve high speed internet and in-flight connectivity markets at scale, offering fiber-like services both in terms of price and speed,” Belmer said in a statement. Eutelsat said the Konnect VHTS satellite fits within the company’s annual capital expenditure plan of 420 million euros.